Housing Starts Up; Redistricting Key Issue In Elections; Fed Has Hard Choice : The Two-Way While housing starts rose, the gain was mostly from construction of apartments and condos, not the much larger single-family home market. "These deaths make 2010 the deadliest year in the almost nine year war. 529 international forces have been killed so far this year." We've also already reported about a debate set for later today in the Senate, over whether to repeal the "don't ask, don't tell" policy that bars openly gay men and women from serving in the military. 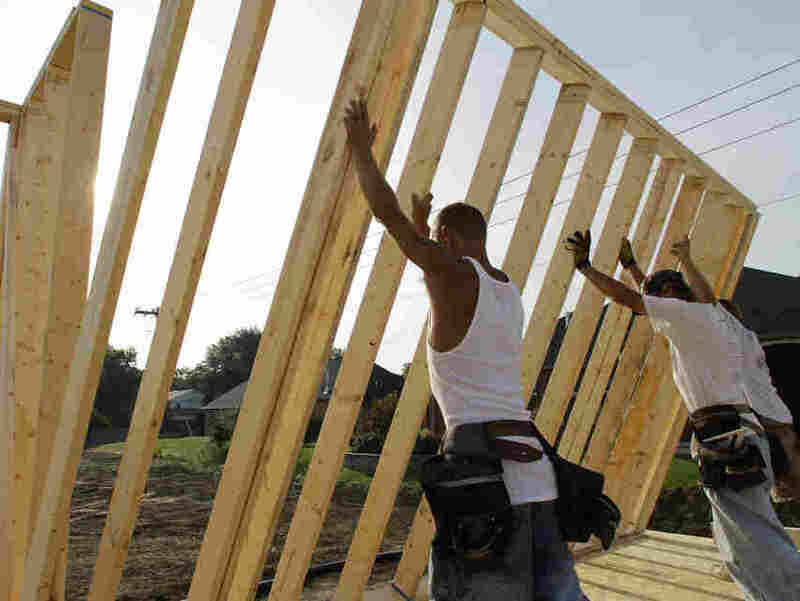 -- Census Bureau -- Housing Starts Rose 10.5% In August: "Privately-owned housing starts in August were at a seasonally adjusted annual rate of 598,000. This is 10.5 percent above the revised July estimate of 541,000 and is 2.2 percent above the August 2009 rate of 585,000." From a related report by the Associated Press: "Home construction increased last month and applications for building permits also grew. But the gains were driven mainly by apartment and condominium construction, not the much larger single-family homes sector." -- The New York Times -- "Short Of Repeal, GOP Will Chip At Health Law": "Republicans are serious. Hopeful of picking up substantial numbers of seats in the Congressional elections, they are developing plans to try to repeal or roll back President Obama's new health care law. ... That conclusion emerged from interviews with a wide range of Republican lawmakers, who said they were determined to chip away at the law if they could not dismantle it." -- Reuters -- Fed Mulls Trillion-Dollar Policy Question: "How much of a boost to the U.S. recovery could another trillion dollars or two buy? That's a tricky question for the Federal Reserve when it meets on Tuesday to debate what would warrant pumping more money into the financial system." -- The Denver Post -- "Broncos' Wide Receiver Kenny McKinley Dead At 23": "Broncos wide receiver Kenny McKinley was found dead Monday afternoon in Arapahoe County of an apparent suicide. Authorities were called to McKinley's home in central Centennial at approximately 3:25 p.m. to investigate a possible suicide. Officers discovered McKinley's body in a second-floor bedroom with what appeared to be a self-inflicted gunshot wound." He was a second-year player on the NFL team's injured reserve list.